For the last week, I have been living under a cloud. A great big, heavy cloud that has hovered above my head and pressed down on me like tonne of bricks. I’m not sure why this dark cloud descended on me one night, nor what started it or where it even came from. How this unwelcome visitor snuck into the house and got past the dog, I have no clue; he normally barks at everything. At the beginning of last week, I was feeling quite bright; the last of the azathioprine was loitering in my blood stream and I had some spare energy still knocking around. So to make the most of this ‘get up and go’, I did stuff. I did a lot of stuff. I did way too much stuff. And then I paid the price. By Thursday I was flagging, by Friday it was all too late. Engines off, power down, body into battery saving sleep mode. My ‘get up and go’ had got up and gone. 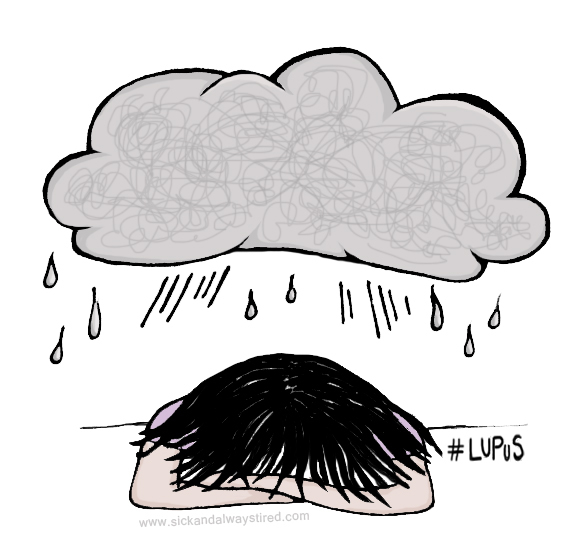 Bugger it, why me and it’s not fair – I hate Lupus. That day and the three that followed could most definitely be classed as inside the house days. I didn’t really move more than I had to, just a slow scuffy shuffle from room to room. I couldn’t be bothered to do anything, think anything or feel anything. I didn’t want to read, write, rest, eat or brush my hair. Worse still, I didn’t want to talk, laugh or even smile. I’d completely lost my happy. Sure I’ve had slumps before, but none like this. My mood was as flat as a Dover sole. But why? Everything in my life (health aside) was great, yet I felt utterly miserable, desolate even. I also felt strangely detached from everything and everyone around me, and I didn’t know how to reconnect. Worse than that, I couldn’t summon up the energy to even try to reconnect. Thank God for my husband, the one who knows me so well. He watched, waited and persevered. He tried every trick in the book to chip away and dig me out from my pit of misery and gloom. It took a painstaking line of questioning, several pick axes, a crowbar and a box of tissues. Oh, and a box of my favourite Lindor chocolates. Two days on and I’m still not sure what that was all about. Perhaps it all stemmed from my frustration and despondency over the great medication fiasco. Or perhaps my brain was short wiring from months and months of erratic sleep. Or maybe my body was simply objecting to going cold turkey after months on the drugs. Whatever the reason, I’m hoping that wretched cloud stays well away and doesn’t invade my home or head space again.